Sir George Carteret, Baronet (baptized on May 6, 1610 - January 14, 1680) came of old French stock on the Channel Island of Jersey, which he held for King Charles I as the last Stuart stronghold that surrendered to Oliver Cromwell. He was a distinguished naval officer, though rather careless in business and without much education. He died too soon to receive the patent of nobility the king had intended for him. Sir George Carteret and Lord John Berkeley were for a while Lords Proprietors of New Jersey, which he named for his home island. Sir George Carteret was one of the Proprietors of New Jersey. He served in the British navy, fought for the royalists, and became lieutenant governor of his native island of Jersey in 1643. Upon the death of John Berkeley, 1st Baron of Stratton on August 28, 1678, Sir George Carteret, Baronet, was named the third Palatine of Carolina. 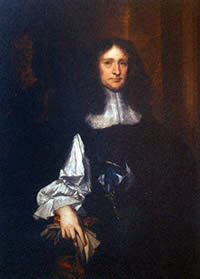 Upon his death in 1680, his share of Carolina was inherited by his grandson, Sir George Carteret, 1st Baronet Carteret. Also upon his death, William Craven, 1st Baron Craven, was named the fourth Palatine of Carolina. Click Here for more information on Sir George Carteret, Baronet from Wikipedia online. Click Here for more information on Sir George Carteret, Baronet from The Island Wiki online. Click Here for more information on Sir George Carteret, Baronet from The History of Parliament online.